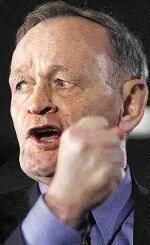 Prime Minister Chretien just reelected for the 3rd time on November 27th, 2000. 1. Thou shalt not care if it costs two dollars Canadian for one U.S. dollar? Thou shalt concentrate on feeling proud about our Canadian dollar and being different than those Americans. 2. We shall pretend that the $600 billion debt does not exist. Its only zeros. Thou shalt pay no attention. Do not discuss the interest -- $40 - $50 billion a year -- more than Ottawa spends on old age pensions, medicare and unemployment combined. It means nothing. 3. We shall tax and spend. The bottom line means nothing. Canadians don't mind being overtaxed. Its the cost of national unity. Therefore they like it. It will stop Quebec from separating. Just because Mike Harris can lower taxes in Ontario and Ralph Klien can do it in Alberta, does not mean that Ottawa can do it. 4. Increase welfare programs and spending. Get as many people as possible on welfare. 5. Increase the number of social workers. The huge caseloads justify the new employees. 6. Allow more illegals into the country. Allow them to be on welfare. They are all good potential Liberal voters, if not now, when we give them amnesty and allow them to vote Liberal. It doesn't matter if they have been declared a danger to the public by Immigration Canada. Let them in. Let them free. Let them vote. 7. Allow all those phony refugees to appeal their legal status to the highest court for at least ten years. It's good for immigration lawyers and the immigration business and keeps countless bureaucrats employed. Send visa officers overseas to find and invite even more refugees. It doesn't matter where they come from or what they did. Bring them in through the U.S. if we can't get them directly into the country. The Americans will allow them to pass through so long as they don't stay. 8. Do not talk about Quebec separatism. It means nothing. It will never happen. Its all an illusion. Western alienation is also an illusion. We will cure that with tough love. Just you wait and see. We did it in Quebec. 9. Send Canadian soldiers to every place in the world where the U.N. points the finger: Bosnia; Somalia; Rwanda; Republic of Central Africa and Haiti. Never take the soldiers home unless theres an official inquiry. 10. Let all the prisoners in all the prisons and criminal psychiatric hospitals vote because we know who they will vote for. 11. Release the prisoners if they can't vote in prison. Then they will vote for us outside the prison. 12. Collect all guns or have the guns registered. Then have the owners fingerprinted. Then add some more rules about photographs and tattoos. 13. Keep telling the people that it is our good intentions that count -- not what we do. 14. Travel the world with a Team Canada sign. Sign up a planeload of other politicians to fill the spaces so that no one can say we are irresponsible. The Liberal Party system of catering to every minority group and special interest group is not democratic. It is a gross manipulation of the so-called democratic system based on patronage by the Liberals who only have 41% of the 62% Canadian vote. Therefore a tiny but highly organized political group runs Canada. If you are not a member of the Liberal Party you can still benefit from their largesse by being a member of affiliated groups: lesbians, gays, feminists, vocal minorities, Indians, Quebecois, civil servants, friends of the prime minister, trade unionists, live in Shawinigan, have no ethics, socialists, Justices of the Supreme Court. They all benefit in one way or another in this vast left-wing conspiracy. But if you are just an ordinary individual Canadian and not a member of one of these groups you could be classified as an outcast. You have not been type cast yet. The Liberals frown on individualism just as the communists did in Soviet Russia. And if you identify these Liberals for what they are, you might be called any number of names: scary, redneck, biased, bigoted, racist, homophobic, from the dark side or a member of a vast right wing conspiracy. The Charter allows you to be a member of an association but it does not allow you to be an individual or refuse to be a member of an association or refuse to pay union dues. This issue came to light during this past election. It showed that if you were a Quebecois friend of the prime minister, you could get an almost limitless supply of taxpayers money from the government through government associated bank loans or HRDC grants. And if they bothered you about mortgage payments, that would suddenly stop when those who were bothering you were fired. And to show just how far down this garden path that Canadians have been led, they voted the Liberals back into power with an even bigger majority on November 27th, 2000. Unfortunately for Canada the Liberals have been elected again with a majority in Ottawa. But very few Liberals got elected in the West. It means that vast areas in the West will not be represented in the decisions made in Ottawa. But that is only part of the problem. Under the banner of human rights the Liberal/Socialists of Canada want to change this country and tax and spend their way to socialist/communist heaven. Their audacity and ability to appeal to the Canadians in the East is impressive. They have programs suitable and adaptable for every group, organization, culture, creed, language, inclination, or activity. They cater to homosexuals, feminists, deviates, prisoners, ex-prisoners, pornographers, pedophiles, appointed-for-life Supreme Court justices, abortionists, Indians, religious folk, non-religious folk and just about every identifiable minority they can appoint or buy. They are a graphic illustration of how society can be led by a political group with enough testicles, tenacity, power, flexibility and propaganda to appeal, not to individual Canadians but to the groups within Canadian society. Their ability to increase the national debt -- $600 billion -- can only be matched by their ability to decrease the value of the Canadian dollar -- 64 cents. Their friends at the CBC and the Star push the constant propaganda -- the Liberal Party line. This constant propaganda distracts Canadians from economic issues -- HRDC handouts, CIDA giveaways, Auditor General's Report, the value of the $C, the national debt, by regularly drawing Canadian attention to socialist issues, refugees, war-torn children in far-away places, torture, Amnesty International and the UN issues. Their propaganda is blatant politically correct international socialism. Their friends at CIDA send millions each day to almost every country in the Third World. No one seems to control this giveaway madness. No one protests or even bothers to ask why. There is something seriously wrong in Canada. And the people who do it have just been reelected. 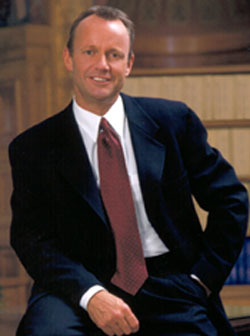 STOCKWELL DAY Leader of the opposition during the few days of the year when parliament is open -- 92 days in 2000.